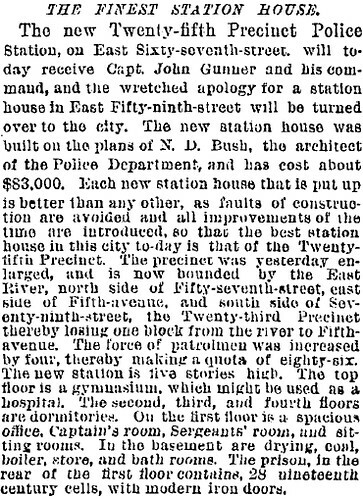 Today I found this short, but sweet, description of the new 25th Precinct from the November 30, 1887 edition of the New York Times. In addition to a nice description of the facilities, it also offers information on an expansion of the precinct territory at the time. View NYC 25th Precinct 1887 in a larger map Using that precinct description, I’ve created a map of the precinct lines.Oddly enough I will be driving across the 59th Street Bridge tomorrow and walking around that exact area! 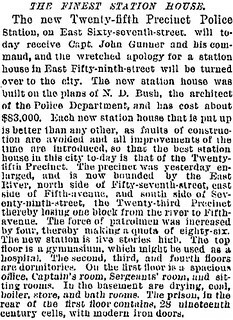 Article Source: The finest station house. (1887, Nov 30). New York Times (1857-1922). Update: A year later we took the kids for a walk over to take a look at the station house, and made a neat photo fade of us standing in the same spot as great-grandfather Mike.